After my eldest son got to see his two favourite bands live in concert, I made a promise to my younger son. I promised him that if his own favourite band ever toured again we would go and see them come hell or high water. Sam was twelve at the time but he was already a keen drummer with the rhythm firmly planted in his heart. So it was. Just as he turned fourteen, the Foo Fighters announced their tour, a massive stadium tour. All of a sudden, I had promises to keep, and I was glad to do it. More than anything, the boy deserved his day. The Foos were coming to play here in Ireland, as Slane Castle. I’ve been there, It’s an excellent venue but I was sure that it wasn’t a good venue for me and Sam to go too. I felt that Sam was a little too young for it. The open field, the predominance of tall people, the quantity of alcohol. It wasn’t the time for Slane. So I went mad. I got hold of two very good tickets for Wembley Stadium for Friday 19th June. Sam and I would have our pilgrimage, he to see his all-time-favourite band and me to finally return to the city I had lived in for fourteen years and hadn’t returned to in eighteen. The plan changed as the months passed. It grew. My eldest son would be just finished his daunting final exams in the week that we were going and I sensed that he would like to go too. So I gave him my ticket. He and Sam would now go to the concert and I would travel with them and get them there and get them back. It was all good. Then Patricia was the only one left at home while we all went ‘adventuring out’ and than was no good for any of us. So she was coming too. What started out as a ‘quick-in-quick-out’ invasion turned into a family excursion of the highest order. And all the time, sitting firmly at the centre of the plans and the scheduling, was the gleaming jewel of Sam’s Concert. Much awaited, much anticipated. Much everything. You probably know how this story plays out. 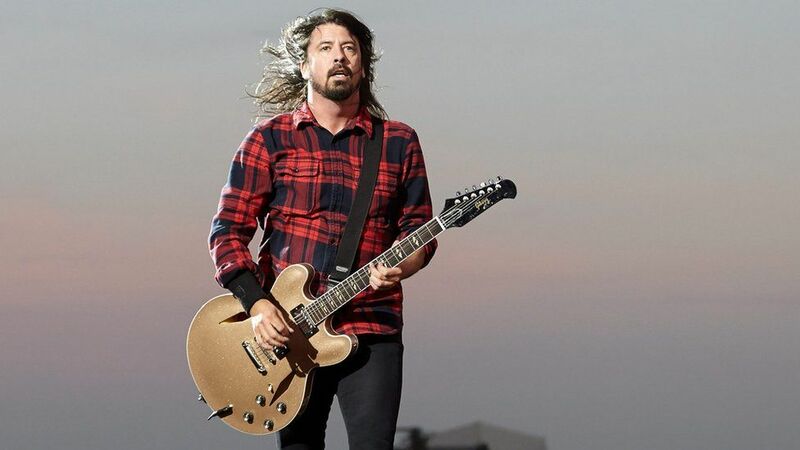 One week before the concert was to start, the excellent brave lead singer of the Foo Fighters, Dave Grohl, injured himself on stage in Sweden and broke his leg. He played on, in true Rock and Roll fashion. He enabled us to believe that the concert would go ahead. He might have to sit down on stage, he might have to change things around, but he would be there. But it was not to be. The leg was simply too broken, the mountain simply too high to climb. On Tuesday evening, twelve hours before we were to leave for the airport for the young man’s first concert, it all fell apart. All of the concerts were cancelled. Wembley Stadium would stand dark on Friday night instead of bathed in light and sound as it should have been. The bags were all packed, the documents all assembled. The plane was fuelled on the runway. But the entire reason for going was suddenly gone. It was not unexpected. I had secretly felt that the concert would be cancelled but hopes were kept high by the sheer status of Dave Grohl, his proven doggedness and bravery. I would have understood if he had ranted and raved, loudly denounced the fates that had conspired against him having his day, but he didn’t do any of that. A single warm tear running down his cheek was the only allowance to the disappointment and the very keen pain of a promise wrenched away at the last moment. It was hard to see. In a year of repeated kicks to the stomach, it was by no means the worst but it had a straw-like quality that challenged the camel’s back quite sternly. We had nowhere to go but still we had to go. There was no cancelling flights and accommodation. We had to gather ourselves early the next morning and hit the airport. And as for me, after eighteen long years away, I had to deal with London again. I’ll tell you how that was. I used to keep up. I knew the names if nothing else. But somewhere along the line I admitted defeat. I have no idea who Foo Fighters are and (unsurprisingly) neither do I know anything about the clearly estimable Dave Grohl. And here’s the thing: I don’t feel bad about it and I don’t feel a desperate urge to rush to YouTube to see what I’m missing. I really don’t have a place in my life any more for pop (in the broadest sense of the word) music. I bought Pink Floyd’s last CD because it was Pink Floyd even though it wasn’t very good (actually I didn’t buy it, someone else did because it was on my Amazon wish list but if they hadn’t’ve got it me I would’ve) and I’ll continue to support Fish for as long as he churns out albums but that’s about it for me. I can’t work over singing and as the only time I have music on nowadays is when I’m sat in front of a computer all I ever play is either classical (again, in the broadest sense), film soundtracks or electronica. Not quite sure where Mike Oldfield fits into all that but he’s good too. I’ve only ever been to one rock concert. I’m sure I’ve written about it before. Blondie came to Glasgow maybe ten years ago and to fulfil a childhood dream of being in a room with (an albeit not-as-young-as-she-was) Debbie Harry I went and it was awful on about just every level. The Glaswegian crowd was… well, very Glaswegian and sang along to everything practically drowning out the band. I waited until they performed ‘Maria’ (which never leaves my Top Ten singles of all time list and probably never leaves the top three) and then hightailed it out of there. I cannot imagine any circumstances that would persuade me to go to another one. I’ve probably not been to a classical concert in as long or even longer. I do enjoy them—there is nothing like being in a room with a full-sized orchestra turned up to 11—but I’m not even sure seeing Philip Glass in concert would persuade me. Now if he wanted to meet me for coffee the next afternoon we could probably work something out. What a dad. He will see them. In time. The promise, planning and execution alone by his father who clearly loves him will help mold him into a great man. I want to know what you guys ended up doing! Och, that's a real shame, Ken. Kudos to Sam for being so brave. Sometimes it just feels like nothing will go right, but that time will pass.